The cost of replacing electronics or dealing with a house fire after a sudden severe lightning strike is enough inspiration to acquire proper storm protection. The expense of purchasing and installing these devices could develop into large savings if a strike were to occur and could even save a life. In order to make the best decision possible for protection from lightning strikes it is important to know what is available to ensure you make the best choice for the situation. Installing a lightning protection system is ideal but being prepared if a storm hits if you don't have one is also important. 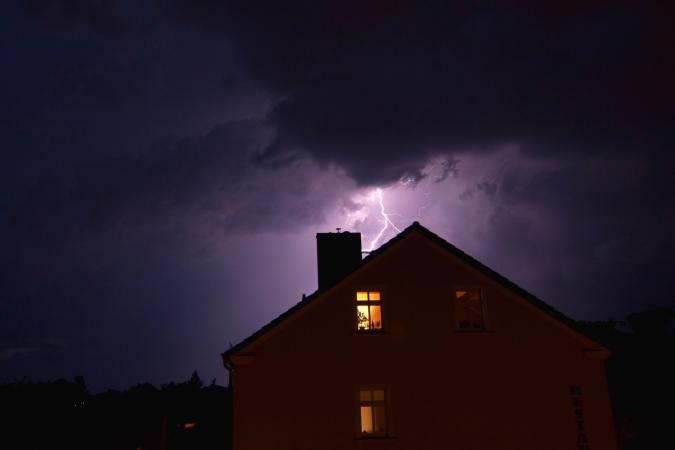 The risk of a building getting hit in a lightning storm is small, but it can occur and if it does develop, it may cause a fire or other serious damage. Throughout a storm, it is important to stay away from any routes a strike may seek once it has entered the building. Therefore, it's important to know where pipes and wires are installed inside the structure and avoid water sources during a storm. Combustion caused by a lightning strike is a real possibility during a thunderstorm. If a structure is hit, the lightning will pass through other materials before reaching the conductive material. The material in the roof construction, which is usually wood, is where lightning is most likely to strike first. 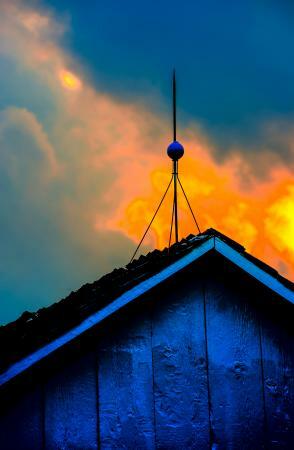 Wood in the roof is often more ignitable than other construction materials. This is why storm-caused fires typically begin in the attic or roof of a building. Once you've determined a building needs storm protection, decide what type of equipment you'll need. Air terminals, also known as air rods are placed at the top of the building. They attract lighting and draw it safely to the ground. This Lightning Protection Air Terminal at Alibaba is a simple, yet elegant design. For a larger diameter of protection around a building, this ESE Lightning Protection air terminal found at Amazon will be a good choice. More decorative air terminals are also available like this DT16B Bronze model. Down-conductors are also known simply as cables. You attach them so electrical flow leaves the air terminal and travels down the down-conductor towards the final protection device. To keep things simple, this copper down-conductor cable provided by Automatic Lightning Protection is offered by length. The cable offered by DEHN has buying options of aluminum, steel or copper. Harger offers more precise specifications when buying the down-conductor cables for a system. Ground rods, or rods, are the final protection device in a lightning protection system. You attach it to the down-conductor and insert it into the ground so the electricity can escape harmlessly into the earth. The Erico Stainless Steel Ground Rod can be ordered to the specifications that are required. An example of a galvanized ground rod is found on Amazon that comes equipped with the clamps necessary for installation. Alibaba has a version of copper ground rods available in various sizes and lengths. Surge arrestors or surge protectors protect electronic equipment within a structure from sudden surges of electricity. They do not provide complete protection in a lightning strike but may help protect plugged-in devices from surges caused by a lightning strike. Surge protector strips are the most accessible protection device to find. They are available at large department or hardware stores and generally range in cost $10.00 to $40.00. They don't require professional instllation. However, keep in mind that while this type of protection helps guard against electrical surges, they are not completely protective. Whole house surge protectors also protect against electrical surges that may move through the wiring system within a building. Whole house protectors are installed in the home near the breaker box and protect anything connected to your house's electrical system, while plug in surge protectors only protect a single outlet. Whole house systems range in price from $100.00 to $800.00 and may require professional installation. Walmart has a good quality surge protector for about $14.00. This CE TECH surge protector is affordable and includes eight outlets available through Home Depot. Including a higher number of outlets, Amazon offers the Opentron surge protector strip. The Eaton brand model whole house surge protector costs around $120. Amazon carries the Intermatic IG2240-IMS Whole House Surge Protector that has modules that are easily replaced when needed. There is an affordable Bussman whole home product available through Walmart that meets basic lightning protection requirements. Purchase and installation of a complete protective system can be costly, but so can the replacement of equipment or damage caused by a fire. Optimally, if you are at risk of a lightning strike, the optimal solution is a combination of surge protectors, like those you can easily find in electronic stores, whole house surge protectors that need to be installed in your home, and complete storm protection devices may be the optimum decision. The Thompson Lightning Protection, Inc. has all the tools and items needed to construct an entire protection system. This company has equipment for industrial, commercial, and residential structures available. Most homeowners can expect to pay anywhere between $300.00 to over $2,000.00 for a system (including installation). There are many factors involved when considering the risk of lightning strikes. Lightning has only one objective, and that is to correct a charge inequality that has built up within the cloud system. To do that, lightning surges toward the ground and its opposite charge to equalize the imbalance. When lightning strikes an object, it is only because that object is creating an easier pathway from where it originated to the point where the electricity is drawn. Many materials are conducive to the movement of electricity and can be a possible channel for a lightning strike to move through. Consider how many lightning storms are present in your area, as well as your area's landscape. A structure in a cooler location may have different lightning risk considerations one in a warmer climate. The conduction factors of the structure, such as pipes and wires that can help electricity pass into the ground, are also important. In light of the expense acquired in the purchase and installation of protective systems, the decision to add such a device will be based on many factors. Each building or structure and the contents held within will determine the worth of adding such protection. The most important factor when determining the need for a lightning protection device is the safety of whoever is in or around the structure during a storm.